Note: You can enter this giveaway one (1) time per e-mail address per day. Deadline is 11:59PM ET 5.4.17. Get the scoop on fresh, flavorful cooking from the authority on vegetarian cooking. 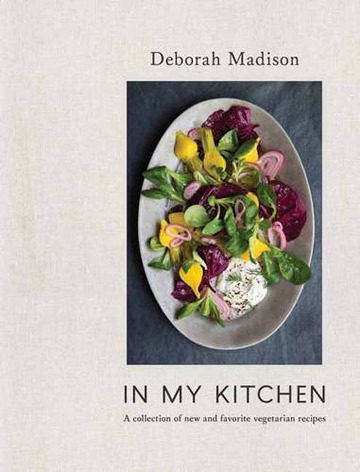 In My Kitchen collects 100 of Deborah Madison’s favorite recipes. A few of the dishes include Roasted Jerusalem Artichoke Soup with Sunflower Sprouts; Fennel Shaved with Tarragon and Walnuts; and Olive Oil, Almond, and Blood Orange Cake. All are pared down to the key ingredients that impart delicious, nuanced flavor when combined with simple preparation steps. Whether you’re looking to make vegetarian weeknight dinners or something for a special occasion, this cookbook won’t disappoint. These Vegetarian Summer Rolls are the perfect light meal – whether as a party starter or a weeknight dinner. NO PURCHASE NECESSARY TO ENTER OR WIN. Void where prohibited by law. Open to legal residents of the 50 U.S., D.C. and Canada (excluding Quebec) who are at least eighteen years old at the time of entry and have internet access. Begins on 4.13.17 at 12:00:00 a.m. ET and ends on 5.4.17 at 11:59:59 p.m. ET. To enter this giveaway, submit your full name and email address on this form. Odds of winning this giveaway depend on the total number of eligible entries received. Only one (1) entry per email address per day. Sponsored by Leite’s Culinaria, Inc. For more information, visit our Official Rules. For a list of winners, check out our Very Happy Winners page. Be sure to add giveaways@leitesculinaria.com to ensure notification if you are the winner.